As a paranormal enthusiast who seeks to travel to the most haunted and ghostly places in the world, the first places I usually think of travelling to are old castles, ancient cemeteries, or houses with long histories and dark shadows. I think of finding the voodoo of the Caribbean islands or the catacombs of the old cities of Europe. I find myself searching for haunted hotels that are off the beaten path. Of course, my family isn't always in love with this. Sometimes they want to go to Disney World. Ironically, this actually suits my purposes perfectly. Somewhere behind all the pink castles, smiling princesses, $50 hotdogs, and giggling children lurks the stories of the ghosts that come out in dark, when the staff is alone. As it turns out, Disney world has many resident ghosts. 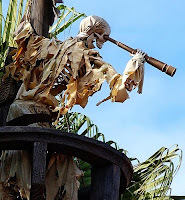 The most popular of these ghosts haunts The Pirates of the Caribbean ride. He hides behind the animatronic skeletons and scares the staff to death when they are alone in the attraction. George was a construction worker who worked on the attraction in the 1970’s. He was climbing a ladder and he fell to his death. Since that time, staff members have said good morning and good night to George over the PA system. If they fail to follow this tradition, the ride will shut down and some staff members report that they’ve seen the ride shut down on the days that this ritual is forgotten. Another ghost has been seen on the Tower of Terror. At the Tower of Terror attraction, the employees share a story about a ghost walking around during closed hours when visitors aren't around. When he's seen, he's walking in the wrong direction. When he's called, he doesn't respond. Soon afterwards, he'll just disappear. Several ghosts have been seen at Spaceship Earth. One ghost is a small girl with long, blond hair who has been spotted riding in a car. Another is a small boy who likes to hang around the girl. He'll run in front of her and vanish into thin air. This happens outside during daytime. So it seems that I can even turn a trip to the happiest place on earth into a haunted journey, which is good because I think this would be the only way I could endure a week in Orlando. That's interesting. Ever since I've been going to Disneyland in CA, I've always had a fantasy that I could get friends together and have a party in the Pirates of the Caribbean ride and drink and party with the animatronix pirates. When you're in the ride, it actually seems like it'd be the freakiest, funnest party ever. I am not a big Disney girl, so when we go this summer it will be my first time on the Pirates of the Caribbean. I am really looking forward to it, especially now that you've given it a thumbs up. cool! never heard of ghosts at Disney...be a blast to have free run of the place at night and have an old-fashioned ghost hunt! I hadn't ever heard of the Disney ghosts either! It's good to know it's not all cotton candy and princesses.